Cologne Cathedral – a Gothic masterpiece rising 157 metres above the Rhine and built in successive stages between the 12th century and tail end of the 19th century (having miraculously avoided being flattened by Allied bombing raids during WW2 despite being left in a sorry state) – has been listed as a World Heritage Site since 1996. It is the most visited monument in Germany. 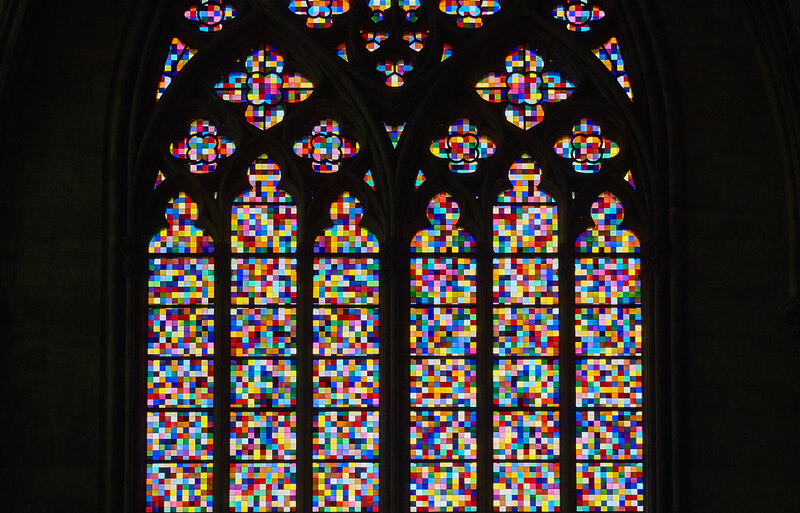 No wonder then that contemporary artist Gerhard Richter’s job of replacing the stained glass windows in the south transcept in 2007 was closely scrutinised and prompted mixed reactions (the Cardinal of the city was markedly absent on inauguration day). Since the early Sixties, Richter has been methodically exploring all the possibilities painting has to offer with a polymorphic body of work ranging from photorealistic paintings to perfectly abstract art. For the Cologne Cathedral project, and following in the footsteps of other 20th century artists who have worked on stained glass (Marc Chagall at Reims, Alfred Manessier at Abbeville and other places, Pierre Soulages at Conques), his initial idea was to deliver a figurative scene of the massacre of the innocents by the Nazis. Unhappy with the outcome he decided to use a 1974 piece of work called 4096 Farben (4096 colours) to create 11,500 identically sized glass squares in 72 different colours simultaneously assembled at random using a computer (although the artist occasionally intervened to change colour combos that he considered to be not quite right). Richter’s colourful glass squares, a piece of work that began in 1966, came about within the context of the questions posed by minimal art emerging at that time as well as the aesthetics of Pop Art which used widely available colour charts. Most of all, they provided a neutral and systematic categorisation of colours based on the basic principle of starting with blue, red, yellow, black and white which were mixed together in multiples of 4 until more subtle shades were attained (4 x 4 = 16 x 4 = 64 x 4 = 256 x 4 = 1024 x 4 = 4096). These were then spread randomly on the canvas. By doing this the artist relinquishes any preconceived idea of representation, limiting his intervention to choosing the size of the both the piece as a whole and the squares within it. « Art created in this way leans towards perfection and expresses the idea of an almost infinite number of possibilities », said the artist a year before the creating the stained glass windows in Cologne. Perfection and infinity: two concepts that have always been at the heart of religious art. Richter’s response to the challenge posed was to extend the principle of polychrome charts to fit the monumental scale of the Cathedral. Hence the sense of vertigo experienced when looking up at the myriad of coloured squares infused with light: you can’t help but think the sublime has been achieved here using mathematical methods and a computer-assisted algorithm to decide where each colour was placed; and that you are witnessing the profane in a place confined to the holy.